Rock & metal players can really amp up sustain, power and performance with this HS Active pickup set designed for Noise Free performance. This set includes Quik-Connect 3-Pin style wire leads and battery clip for easier installation (soldering required). For the Humbucker bridge, choose an 81C Ceramic or 85A AlNiCo magnet style. The Active 81C Pickup uses a Ceramic magnet for cutting-edge, intense yet clean tones. The Active 85A Pickup uses an Alnico magnet for a warm, creamy but still powerful tone. These active pickups are standard covered humbucker size. They are slightly larger than standard uncovered pickups; check your measurements prior to purchase. For the Single Coil neck, choose an Active S (Ceramic) or Active SA (AlNiCo). Select the S Series Ceramic Magnet style pickup for crisp and modern tone. 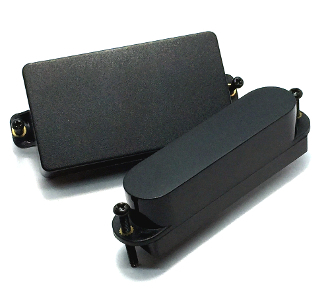 For a warmer, smoother performance, select the SA Series Alnico Magnet style pickup.